away for the week Sat. to Sat. and I wanted some advise. Can I leave him for the week foodless or will that be too stressful? What is your best advice? I don't want to come home to the house smelling terrible either....but if the food isn't in there making it smell it would be ok.
can he survive or is it too cruel to make him wait a week foodless? Also, I read that people have a fasting day for their ACF????? I did not know this before hand. When is that? I feed him AM and PM daily. Xenopus are easy to keep, but there are a few non-negotiables. Filtration, regular water changes, and taking care to not overfeed all spring to mind. Ambient room temperature is usually fine, so heaters may well be optional. The tank is a ten gallon. No filter mainly because I rather clean it then have him bothered by vibration of it plus I couldn't afford one when I rescued him..... anyways, couple weeks back, it lasted almost 1.5 weeks before getting cloudy or dirty... I was surprised. Last week it was quicker. Thank you so much! What is the husbandry you speak of? I will consider the filter too. Maybe I can afford one before my trip even. What is the quietest one to use? Also, I won't be there to turn on and off the florescent lamp. Typically I have it on till I get home than turn it off. I read 12 hours of light and 12 of dark.... he'll be ok without the light then? Someone from the UK replied that he can't go unfed for the week...... you disagree correct? Also, I got a filter. Hoping that helps. Thank you! I have a heater and it maintains his water temp as it says it should be. I will get a filter before I go away. He has a mug and rocks and at this time fake plants in his tank. The sunlight was too bright, I blocked the direct light with a pillow case for now. I don't have another location to put the tank yet. I feel really terrible not being there at my usual times to feed him.... My son doesn't believe he won't die while we are away..... Anything you can just say to me to help me feel better about this? I FEEL SO MUCH BETTER....thank you! Thank you thank you thank you again...are you in the US? WOW it IS beautiful there. What time is it your time? It's 2:37pm here. Yes everything you said makes sense. I think it is best to get the information from one source when possible on this type of thing. I rescued him from impending doom. They are really amazing. I have to ask, how is the ACF eyesight??? early-warning sensors rather than used to find food or probably mates. If I'm emailing too much or asking too many questions let me know. Do you have castles there? Actually what I had read was that the ACF was genetically modified at some time by (idk whom) that their eyes would glow when pregnant. <Nope. Xenopus were used at least as far back as the 1930s. No GMOs then! More questions for you too- What is the best way to go about catching him when I change his tank full change.... I think I've traumatized him a couple times trying to get him into his holding bucket. I don't want to do that but he's a slippery sucker and fast too! SO, I'm back and HE LIVES!!!!!!!!! He was skinnier, naturally I suppose, but he is good!!!! Hello, I just wanted to say I love your site and read it often and find it most valuable resource. I have a two year old female Xenopus which is housed in a planted 40 gallon breeder (Eheim 2217 for filtration) with two other females and she does not seem to be acting normal as of late. She hasn't acted normally for the past two weeks. My other two frogs are very active and always hungry, however, my third frog just not seem interested in food any longer. Also, she appears to hide a lot and never seems to move around as much as the other two, just seems content to hide in the tank's vegetation in the rear of the tank. When I do see her move, she seems to move about normal, she has good reflexes still (like if I turn a light on coming in to the room she bolts like the others do). She does not appear unhealthy but feel something is going wrong here as this is not their usual behaviour. There is no excessive shedding and she looks to be of a good weight still. Their diet consists of two nightcrawlers each per week and the occasional ReptoMin pellets (no better pellet sold in my area sadly). As a treat I feed them a few adult crickets about once a month (she completely ignored them last time I fed these, the other two frogs went crazy for them). I do 30% water changes per week, I use SeaChem Prime as water conditioner, I leave my water to stand for one week prior to using it (though this may be useless with chloramines I've read). The temperature of the tank is typically 20C-22C (I keep my home around 21C). I recently tested my water and I found zero ammonia, nitrite and nitrate was around 10ppm which seems normal as well. Is it normal for these frogs to stop eating like this? I fed her an earthworm about 3 days ago and she took it, but didn't seem to have the usual enthusiasm about it as she usually does. I tried to feed her today and she is just ignoring food again. I've included a picture but as I stated previously, she appears pretty normal at this point. Any insight would be appreciated. I am hoping this is not the beginning of something more serious. Thank you for your response! I will adopt a wait and see attitude, perhaps she is in "breeding mode"? Now that you mention it, I do also have a male frog but he is housed separately. I've had him for about 8 months, he is about one third the size of my females though and I have been waiting for him to grow a bit more before introduction to the other frogs. I'd hate to see my female frogs devour him. I am hoping he grows a bit more. I've considered breeding and rearing these frogs as I do enjoy them. I do fear that I would be overrun with them though as they breed rapidly! Hello Bob, just wanted to provide a small update on my female X. Laevis. Unfortunately not much has changed in regards to her appetite, the frog will only seldom eat and if she does, it is not much (usually half an earthworm). I do not believe she has eaten for close to a week now, but thankfully she still maintains her weight and has not become lethargic nor appears sickly. experienced no ill effects of the move. Any insight or suggestions would be helpful. her a small nightcrawler today and she had no interest.. the other frogs are eating with the typical enthusiasm expected from this species. On a lighter note I have introduced my male frog to my females and it has been successful thus far. He began to call out to the females and performing amplexus literally within minutes of being moved to his new home. All livestock are acting 100% normally, all eat when presented food, save for the one frog I've mentioned. The other frogs will "beg" for food (hand waving gestures), will actively follow your fingers above the water surface in hope of a meal, normal behavior. Now my troubled frog has been reclusive for many months.. Prefers the rear of the tank and is only noticeably active at night, my other frogs are mostly diurnal which is typical in captive Xenopus, they are nocturnal in the wild I believe? The current temperature in my home is 68F and the tank is typically a few degrees higher, right now the thermometer is dead on 70F. Hey WWM. Thanks for all the great info! I am usually on here looking for information on my reef tank, but now I have some questions about my African Clawed Frog. I got him about 2 years ago from a grow-a-frog kit and he has always been quite amusing to me. After doing some research recently, I think I may be doing some things wrong. I keep him alone in a 5 gallon tank (his female partner jumped to her death from a tiny hole, which has now been covered) with just some plastic tank decorations and a basic foam filter. I would like to add a fine sand bed and perhaps some more life to the tank. Firstly though, I think I may need to change his feeding. Currently, he is only fed the grow-a-frog pellets, a little bit twice a day. From what I have read, he needs more diversity than this. I would love to get away without feeding him frozen food (if possible) and was wondering if I could get away with feeding him a variety of quality flakes and pellets (wondering if you could suggest any)? I am also looking to add some more life to this tank. It is my understanding that fish are a no-no? If not could you recommend some plants or inverts or something else that would go well with my frog? Also, my frog produces a lot of waste that generally ends up as a kind of detritus of frog waste and uneaten food at the bottom of the bare-bottom tank. I just siphon it out, but if I added a sand-bed how would I clean this? Is there some kind of snail or other invert that would help clean this up? Well, that's all the questions I can think of for now. I may think of more later! Thanks for the help! Thanks for the quick reply! So basically I have a few questions that were brought up by the answers to my previous questions! First of all, when you were talking about adding something to avoid constipation you mentioned brine shrimp. I have some frozen Spirulina enriched brine that I feed my fish sometimes. Could I use this with my African Clawed Frog? Secondly, for the tank mates, I did not know that I could mix African Dwarf Frogs with my African Clawed Frog. Did I understand you right when I heard this? Also, the Red Cherry Shrimp look really cool, but would my frog make quick meals of them? I was told they will eat practically anything they can fit in their mouth! What would be a good amount of shrimp for this tank? Finally, are there any plants you could recommend for this tank? Thanks. <Ah now, if you have Xenopus in 5 gallons, no wonder the tank is dirty! Ok, so I will start adding some Spirulina-enriched brine to its diet. I just wasn't sure because of the Spirulina. Does once or twice a week sound good? Also, how much should I be feeding this guy? The grow-a-frog recommend twice a day. Does this sound right? When I feed him if the pellet is not directly over his head, he will not see it and won't eat it. It generally takes a couple times before I finally get a pellet to land directly over his head, and he never eats food off the bottom of the tank. I think this is definitely hurting the water quality. Plus, my frog is only getting 1-2 pellets each time I feed. Does this sound normal? I think I remember reading something about them having terrible eye-sight? So basically my only tank inhabitant option are apple snails? Ok, better than nothing! You think they will be safe from the frog? How many would you recommend for my 5 gallon tank? Would I need to supplement feed them or would they eat the left-over food, etc? There is little to no algae in my tank, but plenty of detritus! I will also definitely look into the plants you recommended. I'm inexperienced in the field of freshwater plants but I have a reef tank so...how hard can it be? I don't think my light is very good...It is a Marineland fixture with 16 LEDs but I think each LED is like .1 or .2 watts. Is that enough to support any of the recommended plants? Are the floating plants ok if I have an acrylic top on the tank? I will also look into a canister filter. You think that would be better than the Tetra Whisper HOB filter I currently have? If I end up keeping all the equipment I currently have and not upgrading, what does my maintenance (I.e. water changing regimen) look like? Since I have a marine reef tank, I am definitely used to and ok with some maintenance. Am I looking at weekly water changes? That's what I do with my fish tank so that would be fine. Also, I have no idea why it would affect any of the answers you have given me so far, but my frog is male, so he is smallerish... Thanks for all the help! I'm really just looking for the most affective ways to turn a tank with a frog and a plastic castle into some kind of ecosystem with other life, plants, etc. and ways to better the health of this amusing creature! Thank you so much for the information I have gotten so far! Basically what I have decided is that a tank upgrade is in store. Unfortunately right now I really don't have the room or funds for a very large tank. However, I have found one that would be an upgrade to the one I have now. It is a 7-gallon bookshelf tank so it is more space, but the best part is the dimensions. I know the African frogs like shallow tanks and this one is perfect! It is 24" long and only 9" tall. It also comes with a very powerful filter. I am very excited. I am going to add a 2" sand bed and was wondering if there is anything in particular that I need to look for in a bag of sand that will be suitable for my African Clawed Frog? I will be adding some driftwood, decorations, and live plants. Lastly, I was wondering if this upgrade would now warrant the addition of another ACF and/or an apple snail? If another ACF is ok does the gender and/or size and/or color matter? Also, would it be okay to keep an ACF from my fish store with this ACF even though he was part of a kit and I think may be slightly different (as a tadpole his skin was transparent; are all ACFs like that?)? I was hoping to perhaps get an albino or some other color. What are your thoughts? Regardless, I think this will be a cool tank! I have been to the article you directed me to and that definitely helped a lot. Two ACFs in a 7-gallon is just not going to work. Scratch that. Also, the sandbed thing makes a lot of sense. My question is, with a small sandbed will this limit the types of plants I can put in my tank? Also, I found a place online that sells large pieces of driftwood (15") with Anubias already attached to it (perfect!). The driftwood is long enough that I can add other plants in the future. I want to try to add as many plants as possible to help with the water quality. I will definitely do floating plants as well. This is probably a dumb question, but with the floating plants I assume you just drop them in the aquarium and leave them there? <Depends on the species. Mostly yes, this is what you do. But some varieties grow above the waterline and are notoriously sensitive to the hot, dry air inside the hood (Salvinia is the classic example, but also things like Pistia). These usually die after a few months, or at least, they never look nice because their leaves are either burned or rotting. I guess the real question for me is should I pay a lot more for a 10 gallon kit or will I be able to keep the 7 gallon adequately clean for one ACF? <For a few dollars, I don't see any benefit to going with 7 gallons. Volume trumps everything else in keeping aquatic frogs, and money spent on the biggest tank you can afford is money well spent. A smaller tank is limiting and can't be upgraded or easily fixed if you find it still has problems. The funny thing is that the kit I bought this guy from actually expects the adult ACF to live in like a 1/2 gallon cube its entire life! Had I known more about these guys I would have just bought a big tank and a couple ACFs at my fish store! <Unfortunately both Xenopus and even more so Hymenochirus spp suffer from being seen as "novelty" pets and are sold by retailers who have absolutely no business selling livestock at all. It's a shame really because both types of frog are very undemanding. But you do need some understanding of their non-negotiable needs from which to work from. There's a nice, readable book by Andrew Gray called "Keeping Amphibians" available through Amazon for precisely 1 cent plus postage. It's not a "deep science" book but it does cover all the basics and has quite a few pages about Xenopus. If you haven't got this book, let me recommend it as money well spent. So I am thinking that getting all the parts separate might be less expensive than getting a kit for my tank upgrade. I am thinking of something like the Wal-Mart 10 gallon. I had a quick question about filtration: Is there anything I should or shouldn't have for filtration for ACFs? Trying to decide on an HOB filter and I'm seeing cartridges, filter floss, bio wheels, bioballs, ceramic rings, carbon, etc. Is there something that would really be good/bad for an ACF tank? Specifically I am concerned about chemical filtration. 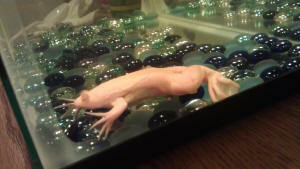 I have a 20 gallon tank that houses 2 African Albino clawed frogs. I do not have a heater but the water temperature does not seem to be an issue as one is thriving and I have another tank right beside this one that houses another frog. <Could well be so. Room temperature, 18 C/64 F, is fine for Xenopus laevis. Xenopus tropicalis, on the other hand, does need tropical conditions. One of the aforementioned albino frogs is growing at a regular speed while the other one is not. I thought there might be an issues of one hogging all the food ( I feed them frozen blood worms). To prevent this I moved the smaller frog to another tank by himself so there would be no issue of getting enough food. This did not seem to fix anything though, he is still small and not eating but he is quite active and otherwise acting quite normal. Putting the food right in front of his face does nothing to encourage him to eat, do you have any other tips I could try to get him to eat? Could this be cause by the early stages of an illness? <If he's otherwise happy and active, and eats something, if not loads, don't worry too much. Act proactively of course, checking water quality and water chemistry. They have been housed the same for at least 3 1/2 years, with 2 filtration systems and a water heater that is set to 75Ã'Âº. Just wanted to follow-up with you guys. I have attached a series of pictures. The first 4 are from when I first emailed you guys about my frog looking emaciated, refusing to eat, and while he was behaving as if he was lethargic (around Sept. 20, 2011). You had responded that this sounded like red leg. I began treating with Maracyn Two. (Treated for the full week and had removed the carbon filter during that period). After the full week of treatment, we replaced the carbon filter to end treatment. At that time, he was only willing to eat nightcrawlers. Hello, I have 2 African clawed frogs, they are roughly a year old. One is brown, and one is albino. The brown one has always been a little finicky about eating, but the albino is quite a glutton!! She has never, ever refused to eat. They appear healthy, no visible signs of anything, and the water is fine..
because they hang out on the bottom of the tank so they are easy for him to find. I have tried blood worms and of course he can't see them so it is just a mess. A couple of days ago I got him a new bunch of shrimp and 1/2 of them turned white and died. They weren't fuzzy or anything just not see through anymore. I don't know if it makes a difference but most of the shrimp were pregnant. 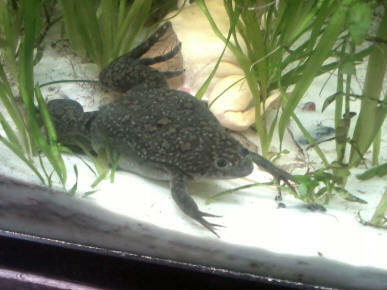 But before this my frog developed black spots which almost look like markings on his back and hind legs. so he might not be and was probably just his natural markings coming in. But I thought he was a little big for him not to have any markings yet if he was going to have any. His Veins on his feet and one very defined vein on his arms are visible too. I attached a photo of him in the tank and out of the tank. If you could let me know what you think about the pet stores response and what I might need to do different if there is something wrong with him and/or my tank and what it may be I would really appreciate it. I'm sorry, I was asking about my second tank. My first is housing 2 Xenopus whom live alone. They are in a filtered unheated 20L. You think I should stay away from the feeder guppies? <Yes. Nobody expect people selling feeder guppies thinks this a good idea. a nice small group of Danios up top and Corys on the bottom wouldn't be too aggressive towards them. As for feeding the frogs, I will definitely hand feed with a turkey baster, so the faster fish won't steal everything. I was just trying to add a little color to the middle of the tank. I have an African albino frog. She hasn't eaten in over two months. At first I thought she was sick, so I used Maracyn two. She still doesn't eat. There seems to be nothing wrong, I've looked at pictures on different web sites for bloat, red leg, She doesn't seem to have either. Could she just be hibernating? I clean the tank, even though I am sure she is not producing waste..
<Michelle, we need much more information than this. How big is the tank? What are the water quality parameters (especially nitrite and ammonia)? Hello. Zota is a female AFC just under 2 years old. I house her in a 10 gallon tank with a few live plants, a small terracotta flower pot & a couple other ceramic (food safe) dishes for her to hide in, & a few scattered large rocks. I use a heater which seems to keep the water around 78 degrees, but after some recent reading I have dialed down the temperature a bit and will be trying to keep it closer to 74-ish. I have been de-thawing a single frozen brine shrimp and feeding her one daily, although after reading other posts it sounds like this may be too frequent? As a tadpole, I fed her aquatic frog pellets in a little bowl in the bottom of her tank. She does not seem to find/ eat food that floats so I am limited to food that will sink and sit in her feeding bowl. even though I do not know what the problem is. If this sounds like the best course of action, can you suggest a particular product to look for in a pet store? Also, I had heard these frogs were very sensitive to sounds and was told using a filter was the equivalent of them listening to a jack hammer all day. I use a battery operated vacuum for quick upkeep/ removal of debris in her tank and when I change her water, I usually change all of it and rinse out her aquarium and I do this approximately every 3 weeks. I treat the water Aquasafe and use quick dip strips to reassure myself that I do not have chlorine/ nitrate/ ammonia/ etc... issues. Your site seems to recommend using a filter. I have a whisper filter for a 10-gallon tank that I could use if you don't think the sound is too much? Thank you in advance for your time & consideration. I adore my frog & want to help her get healthy again. Wow! You are guys are great! Thanks so much for the quick response. I made a donation to the site & will be telling others about you all. I did not mean "brine" shrimp... I meant to say I've been feeding her one krill a day which are pretty large. <Ahh! That's a "shrimp of a different colour!" And nutritional value. I'm going to look for earthworms at the pet store and try switching between the 2 products. For a new food routine I thought 1 krill one day, cut up worm the next day, followed with a food free day, then repeat. Does this sound good? I changed her out to a 20 gallon tank I own which has a nice filter and kept the 10 gallons worth of her old water to start it up along with all of her old plants & goodies. It was quite an adventure in my kitchen today moving fish between 3 tanks & a lot of 6 gallon buckets/ pots & pans full of water. Several hours later & me with very pruny hands, everyone is in their new homes. I will take your advice on how to change the water- which sounds like what I do for my fish tanks. There is so much information online, it is hard to know what to follow. I had read elsewhere that frog water should be completely changed out instead of just 1/3 at a time, but you folks sound much more knowledgeable. Zota ate a krill tonight & seems to be feeling better. I'll keep an eye on the skin shedding. I would love to find her a full-sized (as opposed to "meal" sized) tank mate so she's not alone. She was the only one in the biology lab at the university I adopted her from. As a Washington state resident, I'm under the impression that I cannot buy one and have it sent here. Any ideas on how I could find her a buddy would be greatly appreciated. I have a Albino African clawed frog in a ten gallon by her self with natural river rocks and a cave. I feed her Tubifex worms and red wigglers. Recently I noticed that the one side of her stomach looks purple-ish almost like from the inside out. I was wondering if this is normal. I had a aacf when I was little and don't remember her ever looking purple. <Hello Faith. No, it's not normal. Do read here and see if the symptoms you're seeing matches anything described.